Stunning gemstone necklace, handmade from subtle graduated peridot gemstone beads, which have been threaded onto sterling silver wire links. Beads are quite small, and graduated in size from 5x3mm to 9 x 7mm. This is beautiful new Thomas Sabo Sterling Silver necklace. It has the TS logo, a hallmarked, and 925. It is made from very pretty pink stones, possibly Rose Quartz, not too sure. Gemstones : nugget are tiny sizes averaging 4x2mm per nugget. Stunning long natural gemstone necklace, made from tiny solid genuine raw Australian opal gemstone chip nugget beads. 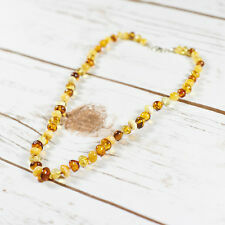 Theme: Special OccasionLength: Over 35"
Subject of this offer is polished amber necklace. This particular necklace is made of natural Baltic amber beads in yellow, honey and brown (cognac) colours. Amber beads are placed on brown string finished with sterling silver (.925) clasp. Check our shop for matching bracelet! . Gorgeous and sophisticated,real aquamarine bead necklace with a delightful classic 1950's/1960's Modern feel.For that sophisticated Audrey Hepburn style. 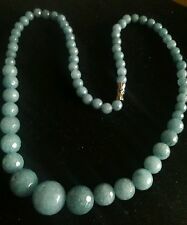 An 18" beaded necklace made of natural authentic Opaque(not transparent) Brazilian aquamarine gemstones.Pale sea blue,cloudy 5-14 mm real gemstone beads,have been cut and polished to a classic round shape with dainty hexagonal facets for a little sparkle.With a stylish, secure,easy to use stainless Rhodium plate screw fastener. Apatite gemstones are quite soft (only around 5 on the MOHS scale), and need more gentle handling compared to the harder gemstones such as agates and rubies. Wash in lukewarm soapy water only, no chemical cleaners, no chlorine, / hot heat nor ultrasonic cleaners. Stunning gemstone necklace, handmade from natural Lapis Lazuli gemstone beads, which have been threaded onto sterling silver wire links. Location: Afghanistan. Gemstone information. New listingLabradorite Necklace gold Overlay On Solid Sterling Silver, New. UK Seller.18"
Gold overlay on solid Sterling Silver real labradorite faceted rondelle gemstones necklace. 17" Rose Quartz necklace, soft feminine shades of pink. 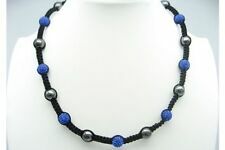 The beads are 12mm and the necklace is individually hand knotted for flexibility and safety. Hence the reasonable prices, I don't wish to make a huge profit. Three Strand 12-15 mm Oval Shaped Faceted Bead Necklace. Shortest Strand 16" Longest 18". This is a stunning and unusual sterling silver Victorian style necklace with a pearl and purple gem stone pendant. 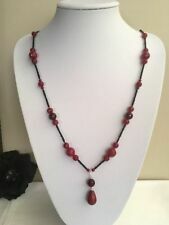 This beautiful necklace will look amazing worn by any lady. Stone /Gem: Unknown - Purple grainy stone?. 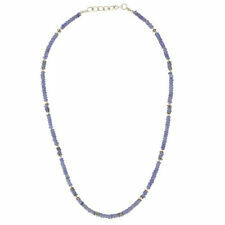 This elegant Lapis Lazuli necklace is hand-knotted with a strong thread and is suitable for daily wear. TheLapis Lazuli beads are round and are approx 12 mm in size. Clean with a damp cloth only as needed. New listingPeridot Gemstone Beaded Necklace Solid Sterling Silver, Chain, New. UK Seller. Solid Sterling Silver real peridot gemstones necklace. It is supplied with an adjustable clasp in solid Sterling Silver which can be worn at 17.5 -18" length. New. Supplied in an attractive gift pouch. Peridot gemstones measure approx 6 X 4mm. We are an experienced family jewellery business called The Town Jewels, situated in Devon. Thankyou. Collection station availableMetal: Sterling SilverStyle: Strand/StringLength: 16 - 17.99"
Unique handmade necklace with 4-5mm small purple freshwater pearl beads. interspaced with 4mm lilac Swarovski beads. Handmade by. silver plated on brass clasp. Stunning gemstone elegant necklace, handmade from solid Amazonite gemstone beads, which have been threaded onto sterling silver wire links. A stunning layered natural gemstone necklace from the Egret collection. 3 perfect strands of a mixture of gemstone and seed beads layered with a crowning quartz teardrop. Materials: Seed Beads | Agate | Jasper | Quartz. We will do our best to solve the problems.Anthing can be resolved through communication. the one you have paid for or is faulty, we will. by money back, if the product you receive is not. experience here, if the product is not the one you have expected. Brand: UnbrandedLength: 18 - 19.99"
Espirito Santo Aquarmarine Necklace. 925S White Sterling Silver = 1.500 gms. Aquamarine = 172.000 Cts. 2406226 / 28. Strongfields The Jeweller - Member of The National Association of Jewellers Thank you for taking the time to take a look at this beautiful necklace which was originally a GemsTV product and still has their tag intact - it has never been worn, in fact it has never been out of its' box other than for us to take these photographs. This item was a phenominal sell-out for them. You can still see the item for reference on their website - the product number is MCBP06. However you can no longer buy one from them as they were a complete sellout. This stunning necklace contains 7 x layered strands of 6mm diameter, rondelle cut, 100% genuine, natural tourmaline gemstones. You can see the fantastic colours and the way they have been graduated in our photographs. Note:As u know,most of the stone was the natural stone,when u get the order,u will receive a similar with the picture,similar shape. we will do our best to solve the problems.Anthing can be resolved through communication. A very pretty agate and rock crystal necklace, which is 18 inches long. In the front part of the necklace the faceted rock crystal beads are vintage ones, as are the pear-shaped grey striped ones (both bought at Kempton Park Antiques Market at different times), and the black agate beads and the rock crystal chips are all new. It has a new silver-plated barrel clasp. The faceted rock crystal beads have slight wear on the facets, due to the age of the beads. Please look at the photos and if there's anything else you would like to ask, please contact me. Please see my other items for sale. UK BIDDERS ONLY PLEASE, THANK YOU. I will combine postage on more than one lot. Ending Friday at 1:14PM BST19h 33mMetal: Silver PlatedStyle: Strand/StringLength: 18 - 19.99"
The necklace is stamped 925 for Sterling Silver on the lobster clasp. The fastening is hallmarked on the fastening its marked 18ct 750 and date letter B also750 on the front with JKA. Stunning gemstone necklace, handmade from solid prehnite gemstone beads, which have been threaded onto sterling silver wire links. Average size of bead: 8 x 6mm. Real, natural rectangular-shaped multicolour tourmaline gemstone beaded necklace. Solid Sterling Silver fittings. Actual one shown. PERIDOT IS AUGUST'S BIRTHSTONE. GREEN PERIDOT NECKLACE. THIS IS A STUNNING NECKLACE USING 57CTS OF GREEN PERIDOT NUGGETS. 925 STERLING SILVER CLASP AT BACK OF NECKLACE. YOUR NECKLACE WILL BE WRAPPED IN TISSUE AND SENT IN AN ORGANZA BAG. Stunning gemstone necklace, handmade from solid Citrine gemstone beads, which have been threaded onto sterling silver wire links. Gemstone information. Necklace Ruby 1168ct Genuine Round Shaped Big Bead 12-20mm 18- 40" E699. Round Shaped Approx 1168ct Beads Approx 12-20 mm. Real Earth Mined 1 Strand 18" Necklace. Overall Length End To End 20". Style: Strand/StringLength: 18 - 19.99"
Necklace Emerald 20" 6 Strand Twisted 4-5mm Round Bead E310. Natural 6 Strand 4-5 mm Round Shape bead Twisted Necklace. Style: Strand/StringLength: 13 - 15.99"
Stunning gemstone elegant necklace, handmade from solid striped black agate gemstone beads, which have been threaded onto sterling silver wire links. Three Strand 9-11 mm Round Shaped Faceted Bead Necklace. Shortest Strand 16" Longest 18". Green Peridot Crystal Gemstone Statement Necklace "Forest Spirit"
Peridot is associated with the Throat Chakra and is a Protective Stone. It fastens with a Silver Toggle Clasp. "Forest Spirit". MANDARIN GARNET NUGGET NECKLACE. 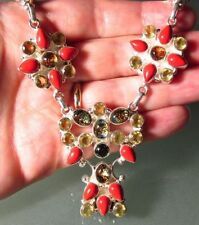 THIS IS A STUNNING NECKLACE USING 50 CTS OF GOLD COLOURED MANDARIN GARNET NUGGETS. JANUARY'S BIRTHSTONE. 925 STERLING SILVER CLASP AT BACK OF NECKLACE. WITH 925 STERLING SILVER BEADS. BRONZE COLOURED PYRITE NECKLACE. OF BRONZE COLOURED PYRITE. THIS NECKLACE MADE FROM FACETED 4MM ROUNDS. SILVER PLATED CLASP AT THE BACK. Real aquamarine gemstone & solid Sterling Silver necklace, faceted bead, UK. Pale real aquamarine gemstone faceted bead necklace. Sterling Silver clasp, beads and extender chain. Actual one shown. Supplied in an attractive gift pouch. MULTI COLOURED TOURMALINE. 925 STERLING SILVER CLASP AT BACK OF NECKLACE. LONG LINE NECKLACE. YOUR NECKLACE WILL BE PRESENTED IN AN ORGANZA GIFT BAG & WRAPPED IN TISSUE AND SENT IN A PADDED ENVELOPE. Stunning gemstone necklace, handmade from solid pale beige calcite gemstone beads, which have been threaded onto sterling silver wire links. GORGEOUS YELLOW / GOLDEN CITRINE NECKLACE (SMALL NUGGETS / CHIP NECKLACE). LONG LINE NECKLACE WITH STERLING SILVER CLASP 36" IN LENGTH. CAN ALSO BE WORK DOUBLED OVER (APPROX 17.5") TO MAKE SHORTER NECKLACE. rainbow moonstone faceted necklace solid Sterling Silver, actual one, new. UK. Rainbow moonstone faceted bead necklace. Solid Sterling Silver adjustable fastening 18 1/2 - 20". Good standard of blue/ purple flashes. Actual one shown. Vintage Multi-Strand Lapis Lazuli Bead Necklace 18K Gold 16"
Labradorite Bead Necklace with Pearls & 14K Yellow Gold Beads 29"